St. Paul’s Lutheran Church is a rural congregation in Lincoln County, Kansas. Chartered 100+ years ago in 1911, it was the desire of the founding fathers to further and strengthen the kingdom of God through the faithful preaching of the Word of God and a right administration of the Holy Sacraments for the forgiveness of sins. In the time since, hundreds and hundreds of people have come to faith through the working of the Holy Spirit and been fed by God’s grace in Jesus Christ. Today at St. Paul’s Lutheran Church the objective remains the same. We continue to uphold God’s holy Word as the only rule and norm for faith and life and strive to teach it in all truth and purity. This is for the hearing and learning of all. We unite together as one body in Christ. God has certainly blessed this congregation and used this church to reach out to and support those within our community at large and in the entire world through the efforts of missions and ministry. 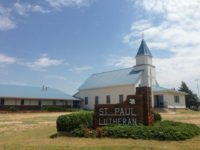 As you explore the content of this website, may you celebrate with us the rich history of St. Paul’s Lutheran Church and the many blessing that God has worked and continues to work among His people. May God bless you in your walk of faith in Jesus Christ unto eternal life through Him!